To submit to our Bake-Along : Fresh Strawberry Cake with White Chocolate Chips, click here. A simple meal, yet so satisfying. I bought some chicken and asked my kids what would they like me to cook with the chicken. My daughter requested for Yoghurt Chicken, seconded by my son. Both of them love this dish, we all do. Have cooked this a number of times but it has been several months since I last cooked it. So Dahi Murgh (Yoghurt Chicken) it is! With some Pilau Rice and slices of fresh cucumber, this is a simple and delicious meal. Both of them had seconds! The Tricolour Pilau Rice actually got its name from the three different coloured veggies, carrots, peas and corns. Long grain basmati rice is used here. The spices that makes the rice fragrant are cumin seeds, cardamom pods, cloves, bay leaves and ground cumin. I have omitted the cashew nuts as my daughter does not like nuts, but if you are a fan of nuts, go ahead and add them right in. Please remove the cardamon pods, and the cloves before serving, they are really fragrant, but the taste is not pleasant when you happens to bite into any of these spices! For the Dahi Murgh (Chicken and Yoghurt Curry), I have posted this before, you may get the recipe here. We love the gravy to go with rice, so I have doubled up the spices and added more coriander leaves inclusive of the roots (do not waste the roots, it is wonderfully fragrant) which makes this dish extremely fragrant. This is a mild dish that even kids could enjoy and is one of my family's favourite Indian style chicken dish, it really is delicious. I encourage you to give this a try, I'm sure you would love it. Heat the oil in a wok, karahi or large pan over medium heat, and fry the cumin seeds for 2 minutes. Add the bay leaves, cardamom and cloves to the pan, and fry gently for about 2 minutes more, stirring the spices from time to time so they do not catch on the pan base. Add the chopped onion to the pan and fry for about 5-6 minutes until lightly browned. Stir in the diced carrot and cook, stirring for a further 3-4 minutes. Drain the soaked basmati rice and add to the contents of the pan. Stir well to combine the ingredients. Add the peas, corn and fried cashew nuts. Pour the measured water into the pan and add the ground cumin. Season with salt to taste. Bring to the boil, cover with a lid and simmer for 15 minutes over low heat until all the water is absorbed. Leave the rice to stand, still covered, for 10 minutes. Transfer to a warmed serving dish and serve. ~ I cooked 2 cups of basmati rice, doubled the ingredients in the recipe, except I use only 3-1/3 cup water for 2 cups of basmati rice. ~ Instead of fresh carrots, I use frozen mixed vegetables (a mixture of carrots, peas and corns). ~ To cook using the rice cooker, follow instructions up to no. 5, after adding water, cumin powder and salt, stir and transfer to the rice cooker, cook as usual. 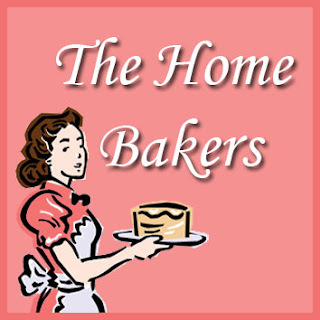 The Home Bakers will officially start their first bake on 3rd April. To find out more about joining in and be a member, visit The Home Bakers for more details!! It has been many months since I last cooked a Tessa Kiros dish, and I Heart Cooking Club is saying farewell to Tessa Kiros, this week being the last week that they are cooking from Tessa Kiros's recipes. There are many recipes of Tessa Kiros's that I have bookmarked to try, somehow time flies ever so fast, and without realizing it, 6 months of cooking with Tessa is already up! So for the final potluck, I have chosen this delicious calamari dish that I will be cooking again and again! This dish is somewhat similar to our local Nyonya dish, where we use tamarind paste for the tinge of sourness and coriander leaves for the fragrance, here Tessa uses lemon juice, dried oregano and parsley. There's only one word to describe, YUMMY! We love it, the only thing that I regret when cooking this is, I only used about 500gm of squids, the next time I'm gonna double up the amount! I'm submitting this to I Heart Cooking Club, where this week's theme is "March Potluck! Goodbye Tessa, And Thank You". Definitely, this won't be the last dish of Tessa Kiros that I'll be trying. I have tried several of her recipes, and all are delicious! I Heart Cooking Club will be going all out with Mexican food with another chosen chef for the next six months, Rick Bayless. Please visit I Heart Cooking Club for more details. To prepare the calamari, firmly pull the head and innards from the body and wash the body well. Cut off the head just below the eyes, leaving the tentacles in one piece if they're small. Discard the head, pull the transparent quill out of the body and rinse out the tube. Peel off the outer membrane and slice the tube into three or four rings. Put the butter into a hot pan and heat until it sizzles. Add the oregano and cook for a moment until it smells good. Add the tubes and tentacles and cook on the highest heat until all the liquid evaporates. Sprinkle with salt and a little pepper and, when it's all turning golden, turn with a wooden spoon and scrape up any bits tuck to the pan. Add the garlic and turn through until you start to smell it. Add the lemon juice and however much piri-piri you like. Let it bubble up, check the seasoning and stir in the parsley over the heat for just a moment longer. Add a touch more butter and lemon juice to the pan if you like more sauce. Serve hot in the pan with bread. This is one lovely cake. I have chosen this cake for our 21st Bake-Along, one of the recipes that I have wanted to try out ever since I got my book, Cake Keeper Cakes. The name of the cake sounds really yummy, Fresh Strawberry Cake with White Chocolate Chips. The cake is really moist and soft. Love the bits of fresh strawberries scattered throughout the cake. The top crust is really soft. As usual, I reduced the amount of sugar. 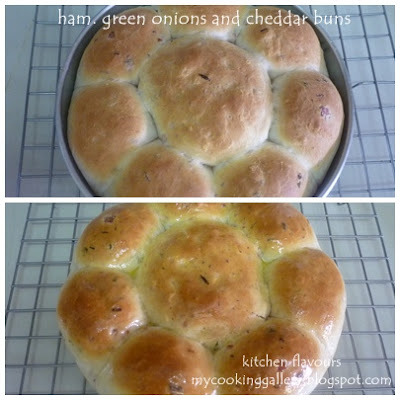 This is great for tea-time and for a quick snack with a cup of tea. Another keeper recipe from Cake Keeper Cakes. Please visit Lena and Zoe to see their bake and also visit our friends who has baked along with us in the linky below. Feel free to join in our Bake-Along, this linky will stay open from 27th March to 2nd April. For our next Bake-Along, we will be baking based on a theme and our theme will be "Theme : Creme Brulee". Ever made any Creme Brulee before, or has it been on your list for ages? It certainly has been on my list of to do! Treat your family with some delicious homemade Creme Brulee and join us on 10th April, the linky will stay open right up to 16th April. See you! Preheat the oven to 350F. Grease an 8-inch square baking pan and dust it with flour, knocking out any extra. Combine the egg, egg yolk, sour cream, lemon zest, and vanilla in a large glass measuring cup and lightly beat. Combine 1-1/4 cups flour, the baking powder, baking soda, and salt in a medium mixing bowl. Turn the mixer on low speed and add the flour mixture, 1/2 cup at a time, scraping down the sides of the bowl after each addition. After the last addition, mix for 30 seconds on medium speed. Combine the strawberries and remaining 1/4 cup of flour in a medium bowl and toss to coat. Fold the flour-covered berries along with the chocolate chips into the batter with a rubber spatula. Scrape the batter into the prepared pan and smooth the top with a spatula. Bake the cake until it is golden and a toothpick inserted in the center comes out clean, 45 to 50 minutes. Let the cake cool in the pan for about 5 minutes, invert it onto a wire rack, and then turn it right side up on a rack to cool completely. Cut into 9 squares and serve. Store uneaten squares in a cake keeper or wrap in plastic and store at room temperature for up to 3 days. Since I'm into bread-making lately, some homemade jam would be lovely with homemade bread. My son requested for some mango jam, he loves the one I made before, Mango-Lime Jam. 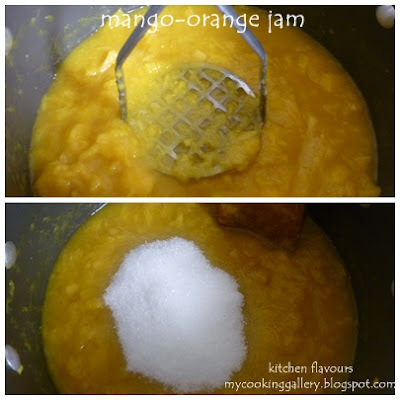 This time I decided to make this Mango-Orange Jam instead, adapted from "The Joy of Jams, Jellies, and Other Sweet Preserves" by Linda Ziedrich, with some changes to the recipe. The original recipe has the option of adding in 1/2 cup of crystallized ginger, since my kids do not like ginger in their jam, I omitted that, though if giving me a choice, I would love to include some crystallized ginger, another time perhaps. Make sure the mangoes that you use are ripe. Chop them up to small cubes and boil them together with about 3/4 cup of freshly squeezed orange juice. 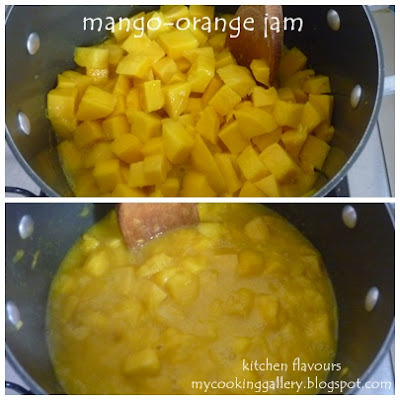 Boil until the mangoes are soft and tender. Remove from heat and mashed up mangoes using a potato masher. Stir in some sugar, I use about slightly less than 3/4 cup (the original recipes uses 3 cups of sugar). I added in about 2 tablespoons of lemon juice as a I like my jam to be a little bit tangy. Stir till sugar dissolves and return to heat, simmer and stir until jam is thick or to the consistency you want. As usual, I like my jam a little runny, as they will thicken up when stored in the fridge. It may take awhile, about 30-40 minutes of stirring as I only used 3/4 cup of sugar, if the full 3 cups of sugar is used, it would take a shorter time for the jam to thicken. Lovely colour from the mangoes. My daughter loves eating the jam this way, butter both sides of bread, toast till crispy, cut into soldiers, dip and scoop some jam and enjoy! Put the mango cubes and orange juice into a preserving pan. Stirring often, simmer until the mango is tender. Remove the pan from the heat and mash the mango lightly with a potato masher. Add the sugar and lemon juice to the pan. Over medium heat, stir until the sugar is dissolved. Raise the heat to medium-high and boil the jam until a drop mounds in a chilled dish. Ladle the jam into hot sterilized pint or half-pint mason jars. Add lids and rings, and process the jars in a boiling-water bath, for 10 minutes. We had a gathering last week and I wanted to bring an apple pie. Since I only decided that very morning to make an apple pie, I wanted a crust that is simple and quick to put together. 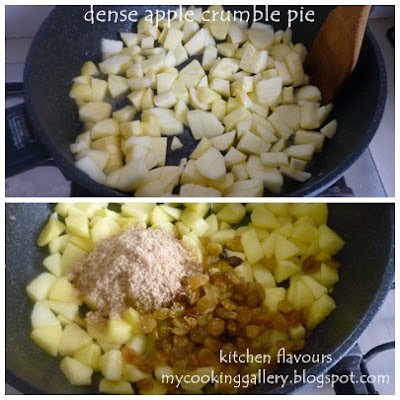 Found this easy crust, actually it is more a crumble than a crust, but it works pefectly as the base for the apple filling. The only changes I did was, I use golden raisins instead of dates as the original recipes calls for. Since I do not own a food processor (on wishlist! 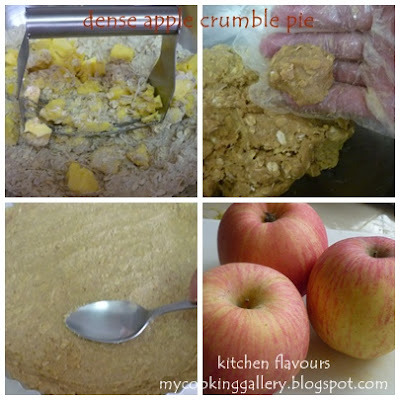 ), I mixed the crumbles by using a pastry blender, which takes about 5 minutes or so. I'm sure with the food processor, it takes only seconds!! The ingredients for the crust are mixed until the coarse crumbs can stay together when mould into a ball. More than half of the amount are then used to line the lightly greased tart pan, at the base and halfway up the sides. Do not fill the sides to the top, as it bakes, surprisingly it will puff up right to the rim of the tart pan. Use the back of a spoon to evenly spread crumbles. I use Fuji Apples and golden raisins for the filling. Melt some butter and stir in the chunky apples, stirring for about 3-5 minutes until apples are somewhat soften. Add in the brown sugar, raisins or dates, and lemon juice. Stir for a minute or two and remove from heat, cool for about 5 minutes. Spread apple filling onto pie shell, spread out evenly. Scatter the balance crumbles over the top, evenly cover apples as much as possible, pressing gently over the apples. Bake in a preheated oven until pie is golden brown and apples are tender. Brought the pan of pie to my sis's place and of course by the time we wanted to have this for dessert, it had already gone cold. Simply reheat in the oven for about 10 minutes to warm it again. We had this with some vanilla ice cream. To make the crust and topping, put the flour, oats, brown sugar, coconut, cinnamon and salt in a food processor and pulse several times to mix. Remove the lid and scatter the butter pieces over the surface. Pulse again until the mixture forms coarse crumbs that hold together when you press them between your fingers. Stop the machine after several pulses to fluff the crumbs with a fork, pulling them up from the bottom of the processor. Evenly spread a little more than half of the crumbs in the bottom and halfway up the sides of a lightly buttered 9-inch pie pan, pressing them into the pan. Refrigerate the crust and set the remaining crumbs aside as you make the filling. Preheat the oven to 400 degrees. Cut each quarter section of the apple in half lengthwise, then cut crosswise into chunks. Melt the butter in a medium-size nonreactive skillet over medium heat. Add the apples and cook, stirring, to soften somewhat, about 3 minutes. Stir in the brown sugar, dates and lemon juice and cook for 1 minute more. Remove from heat and let cool for 5 minutes. Scrape the filling and all the juice into the pie shell and spead it out evenly. 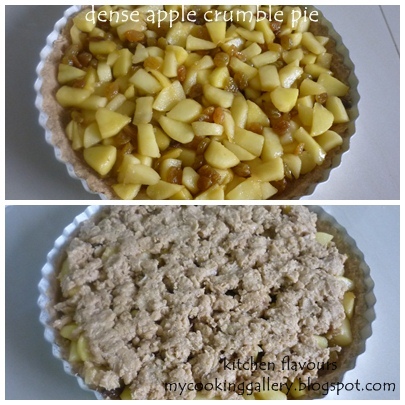 Scatter the remaining crumbs evenly over the top of the pie, pressing them gently into the apples. Put the pie directly on the center oven rack and bake for 20 minutes. Reduce the oven temperature to 375 degrees and bake until the top of the pie is golden brown and the apples are tender, another 20 to 25 minutes. Transfer the pie to a cooling rack and let cool to room temperature before slicing. What's for lunch today? One of Donna Hay's quick Egg and Bacon Pie. This is so easy peasy and would definitely bring some smiles from your kids. What's not to love when bacon and eggs comes together! With some green veggies and a glass of cooled juice, a satisfied and complete meal in a matter of minutes! I used a muffin pan instead of a pie tin as stated in the recipe. Greased the pan and lined with one slice of bacon, topped with the egg mixture and bake for about 15 minutes. Butter and toast some bread till crispy, with some greens at the side and a glass of cool orange juice. Mmmm... this is so simple and both my kids love it. 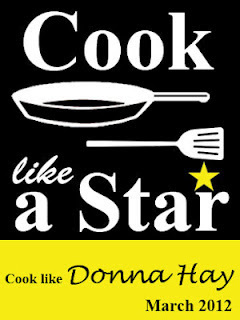 I'm linking this with "Cook Like A Star" blog-hop featuring Donna Hay as the celebrity for the month of March, hosted by my friend, Zoe of Bake For Happy Kids. Please drop by Bake For Happy Kids for the full details and join in the blog-hop! Grease 4x12cm round pie tins and line each with 1-1/2 rashers of bacon. In a medium bowl, whisk together the eggs, creme fraiche and parsley. Add in a pinch of salt and coarse black pepper. Pour the egg mixture into the tins and bake for 25 minutes or until the bacon is crisp and the egg filling is just set. I made some savory buns from my latest favourite bread machine cookbook, "The Artisan Bread Machine" by Judith Fertig. Each bread that I've tried so far have turned out fantastic! I have lots of spring onions in my garden. 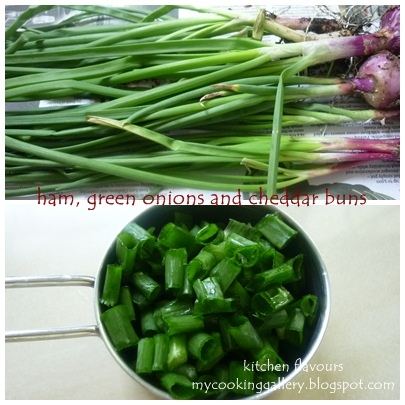 Harvested some of them, most of it goes into my simple stir-fry noodles for our lunch, and used some of it for this fantastic buns. The original recipe is baked as a loaf bread, and there's a variation on making these into a boule. But I wanted these to be small pan-buns, so that's what I did. However, I did not have any bacon, I substitute with sandwich hams instead, which I pan-fried lightly and chopped into pieces. Also I did not have any blue cheese, have not tried blue cheese before actually, but I always have some cheddar cheese in my freezer, so that is what I used. Since both the ham and cheese are already salty, I reduced the salt to 1/2 teaspoon, and it turns out not that salty, so I think the full 3/4 teaspoon would be alright, but I would stick to 1/2 teaspoon if you are watching on the salt intake, it's all a matter of preference. I added in about 1 teaspoon of dough enhancer. As usual, I let the machine do the kneading for me, set at Basic Dough cycle. The top picture is the first rise in the bread pan just before the end of cycle. The second picture is when the dough is 'punched down' by the bread machine just before it beeps, signalling the end of the cycle. 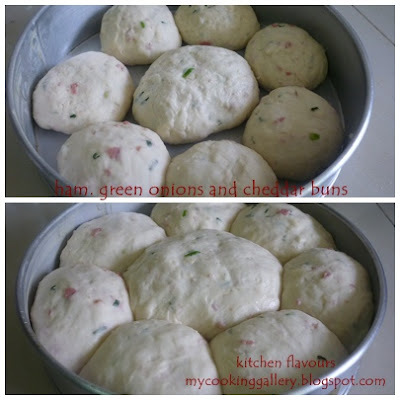 Remove the dough from the bread pan to a lightly floured bowl, divide the dough to 8 round balls as follows, 7 balls of approx 80gm in weight and 1 bigger ball at approx 140gm in weight. Place them in a round 9" greased baking pan with the bigger ball in the centre, as pictured above. Cover loosely with oiled cling wrap and leave to rise for about 45 minutes. Bake in preheated oven for about 18-20 minutes until done. Brush top of hot buns with melted butter for a shiny and soft crust. Leave to cool till slightly warm. Lovely buns! Did I mention how lovely they are? :o) I made some tea while waiting for it to cool a little! The bits of ham and spring onions, the cheese got melted in. Couldn't resist, we ate this about 20 minutes after baking. Yum! We love the bits of ham and the spring onions. The texture is soft and fluffy, very tasty, good enough on its own with a cup of tea! Or tear it open and spread a generous serving of butter! A keeper recipe that I can see returning to my kitchen! Add sugar, yeast and water to the bread pan. Let stand for 10 minutes or until yeast starts to bubble. Add green onions and oil. Spoon flour on top of liquid. Add salt, bacon and cheese. Select the Basic/White Cycle and press Start. 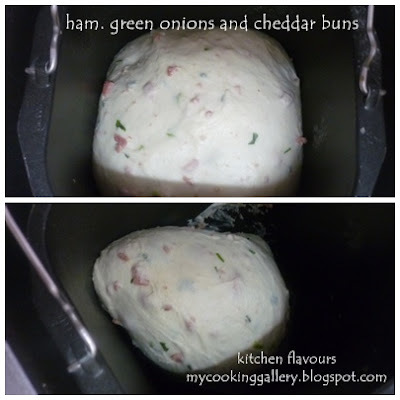 ~ the changes I made to the ingredients : I use sandwich ham which I pan-fried lightly, I use Cheddar cheese instead and I reduce the salt to 1/2 tsp as the cheese and ham are already salty. I added 1 scant teaspoon of dough enhancer to the flour. ~ follow step 1 and step 2 above. Select Basic Dough Cycle. ~ at the end of Basic Dough Cycle, remove dough and divide into 8 round balls, 7 balls about 80gm weight and 1 ball about 140gm weight. Arrange moulded round balls in a greased 9" round cake pan, placing the bigger ball in the centre and the smaller ones all around. Cover loosely with a greased plastic cling wrap and leave to rise for about 45 minutes. Preheat oven to 180C. ~ remove cling wrap and bake for about 18-20 minutes or until done. Transfer buns from cake pan to a wire rack to cool completely. Brush top of hot buns with melted butter for a soft and shiny crust. This is one super easy, delicious dish! Zoe, my baking buddy is hosting a blog-hop, "Cook Like A Star", featuring Donna Hay as the celebrity chef for the month of March. This is the second recipe of Donna Hay's that I've tried and so far I liked them both. This is an easy dish to prepare. Just marinate the chicken with the ingredients and baked it in the oven, that's all. Be sure to taste your marinade before marinating the chicken. After whisking the ingredients together, try for yourself how sweet and salty you want it to be. I find that 1 tablespoon of brown sugar is not enough and added about 2 tablespoons more. And adjust the soy sauce according to your taste. The mixture should be sweet and salty. I did as what the recipes says, baked it in a covered baking dish for one hour until tender. I covered it with aluminium foil since my dish do not have any tight-fitting cover and when one hour was up, the chicken is not brown and sticky! It is all cooked up and tender, but not brown and sticky, so pale looking and does not look so appetizing! But it does smell wonderful, the fragrance from the star anise and five spice powder. I moved the dish up a level in my oven, remove the aluminium foil and grilled it for about 3 to 4 minutes, I can see that it is turning brown, but definitely not sticky, in fact it looked so soupy, as in the picture above! I then remove the dish from the oven, the gravy is really bubbling hot! I added in some cornstarch solution (dissolved some cornstarch in water first), stir it in, coat the chicken pieces with the gravy and return it to the oven to grill for another 3 to 4 minutes. Wow, what a transformation! It is all brown and the gravy has thickened! Looks so delicious! Preheat oven to 200C (390F). Place the ginger, garlic, five spice, star anise, sugar, soy, stock and oyster sauce in a small bowl and whisk until well combined. Place the chicken in an ovenproof dish, pour over the ginger mixture, cover with a tight-fitting lid and cook for 1 hour or until tender. Serve with rice. Serves 6. My second Ciabatta, the theme of our Bake-Along this week. Thanks to Lena for picking this challenge, as it really is a challenge to me! Well, I did finally get the airholes that I was "searching" for! The crust is crusty with moist, soft chewy interior. My first Ciabatta, the previous post here, is all soft and spongy with an equally delicious crust, comparing these two, I prefer the first one. Making Ciabatta is really a challenge to me, I have tried three different recipes, second one is a total failure, as the dough is all too wet and I am unsure whether should I add in more flour as it says that it was more of a batter than a dough, which is really confusing as to what stage or texture would you consider it a batter in bread making! I'm not blaming on the recipe, it's more towards the understanding of Ciabatta making that I'm still learning! For the Ciabatta above, I got the recipe from King Arthur Flour, here, the only changes was I reduced the salt to 1 teaspoon and I added in 2 teaspoons of Pizza Seasoning. And before baking, I spray some water over the dough. The wonderful thing about Bake-Along is it gives us a chance to make and bake something that we would otherwise put on hold until "next time"! Ciabatta is definitely one of the items on my list of to-do, now I am happy to say that I have tried my hands at making these, though there are lots of room for improvement. Practice makes perfect, will try other recipes in my own time now until I achieve the perfect one! Have you tried making Ciabatta before, if not, give yourself a challenge, bake one and join us in our Bake-Along! If you have not been to Lena's and Zoe's, hop over and see their beautiful Ciabatta bake, and also our friends who are baking along with us at the linky below. For our next Bake-Along, we will be baking Fresh Strawberry Cake with White Chocolate Chips, from Cake Keeper Cakes by Lauren Chattman. If you do not have this book, try google for the recipe, I'm sure you will be able to find it, otherwise, you may bake any fresh strawberries and white chocolate chips cake. The linky for this will be open on 27 March and will stay open for a week. Hope to see you! Everyone's welcome to join in.